What started out as a fun thought experiment turned into a pretty good deck. I wanted to build a deck around Thalion and see if I could boost him up. Turns out, not only was I able to do so, but I also was able to have a fun time doing it while beating the quests. Activate Beastmode. Beastmode is activated when Thalion is a Gondorian hero who is smoking a Pipe while duel-wielding Elvish Blades. First, dig out Gather Information. In your opening hand look for another Side-Quest, Thalion, Sneak Attack, Steward of Gondor, Dunedain Pipe...actually its easier to say what NOT to look for. If your opening hand is full of expensive allies and you won't be able to play anything; take a mulligan. Play Gather Information and try to clear it ASAP. It should be said this deck is designed to play against Side-Quest friendly quests (avoid Escape from Umbar for example). Once you gathered some Info dig for another Side-quest if you don't have one already. If you do have a 2nd side quest then grab The Road Goes Ever On so you can find your 3rd (this also thins your deck a bit more than just grabbing the 3rd). If you are lucky enough to have 2 or more side quests already then dig for one of these: Sneak Attack, A Very Good Tale, Thalion. Typical early game play is questing with your heroes to clear the side quests. Once you get a couple allies out, try to keep Beravor up to use her ability. If you get Steward out you should be able to play a ally each turn. If you have a bunch of allies in hand, Gildor Inglorion might make a better Steward. Once you get a couple allies out you should tell them a Good Tale and see who joins your game. That's the basic game play. Flooding the board with allies and using the benefits of the Side Quests to help you. Now, lets talk about why this deck is so much fun to play. This is where I was very surprised at how fun this deck is. I have never paid full price for Thalion. He has either been found using A Very Good Tale Send for Aid or entered play via Sneak Attack. If you sneak him in, and there is 3 Side Quests in the Victory Display, he immediately loses his Ally type and turns into a Hero. This negates the 'return the ally' part of Sneak Attack and he stays in play. The Ultimate Combo is as follows: Sneak Thalion in after questing successfully and you know you will clear your 3rd side quest. Exhaust him to use A Very Good Tale (along with another ally) and get 2 more allies in play. Then, place the progress to clear the side-quest. Thalion is now a hero and stays in play. He readies at the start of combat. This deck also uses the Ranger of Cardolan trick. His texts states he gets shuffled back into your deck at the end of the round if he enters play via his Response. Which means he readies during the Refresh phase before he leaves. This makes him an excellent target for A Very Good Tale. I have got Thalion into play a lot of times using this trick. Dunedain pipe is really useful in a deck that uses A Very Good Tale. If you have expensive allies in hand, place them on the bottom of your deck and hopefully draw an affordable card. Then, when you play A Very Good Tale you first shuffle your deck. Keeping those allies in your deck increases the odds you will have a very successful attempt. The Guarded Cards are needed to fully activate Beastmode. There is only a single copy of each. If you discard one you have a chance to recover it with Second Breakfast. Bartering is here to move Steward of Gondor to Thalion if you played it on another hero earlier. With a side-quest from both spheres in the Victory Display, he is the best target for it anyway. This deck does need a couple turns to get rolling, but that is not unexpected for a side quest deck. Your threat is a low 27 allowing you to turtle a couple rounds. 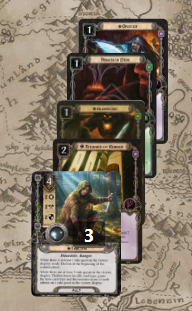 I have played games where Steward does not come out until late game and the deck worked just fine without it. In a multiplayer game this deck should function even better. If you can keep Beravor up to draw cards early,allowing you will hit your combos faster. Mid to late game I have found I don't need the card draw abilities so other players should be able to use them. Don't forget the effect of Prepare for Battle if you clear it!! Good luck and I look forward to hearing if you were able to achieve Beastmode! If only if we could get some weird tri-sphere deck and Hero Elfhelm to boast Thalion (with a mount)... Still.. what a beast! What's with all these 1x events and attachments??? And Exlame Lamecret Lames???? This is hurting my eyes!!! @Seastan I cleared it once because I drew it. It gave Thurindir a willpower, Thalion became a hero and gained the Lore icon. But it may as well as been blank, because it's crappy ability never triggered. @TheChadIn that case why not The Storm Comes? @Seastan wanted to double up on a Lore side-quest. Thalion with Steward is better with both spheres. @TheChadWell the Storm Comes acts as a resource smoother too. Perhaps an even better one. You would only need lore to play for attachment/events. It would probably works as well, like I said I've only played it once. Normally Gather info, send for aid, and whatever I've drawn works fine. I have so many allies in play by the time I've cleared #3 it's a moot point. Well, you've totally changed my mind about Thalion! Apparently he is a more than useable card in the right deck.